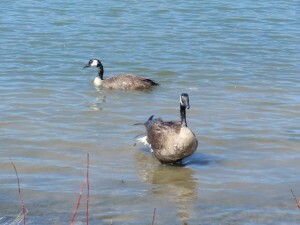 In 2010, we received several reports of a Canadian Goose with a severe neck laceration. A few of the keepers headed down to the lake in the general area where the goose was last seen. The bird was caught and he did have a very deep laceration. The veterinarian at VCA Lakeside Animal Hospital sutured him up and the goose was put into a temporary enclosure for recovery. We were concerned about his mate. Geese mate for life and we did not want her to think she had lost her mate for good, and it was about time for them to be migrating out. There were reports that she was also injured and limping so we went back to find her. She did have a tear in the webbing on her foot, so we also did what we could to help mend her foot. After about two weeks, they were both healed and ready to go, so we took them to the lake and released them together. It was a heartwarming sight to see them fly off healthy and happy.